We have evolved to be energy efficient, and it takes way less effort for us to repeat a known pattern than learn a new one. Research shows that while we may feel like we are making our own decisions all day long, 40% of our daily activity is simply habit. So essentially, whatever we are doing, saying, and thinking is setting us up for our next action, speech and thought. The purpose of a yoga practice is to experience Reality. This requires the removal of what is keeping us from seeing clearly and increasing our willingness to experience direct intimacy. Essential to making any change is an equal combination of diligent attentive practice, disdain for our current limited condition, and taste of and desire for something different and deeper. Patanjali describes this in Sutra 1.12 (abhyasa vairagyabhyam tannirodhah). Specifically this sutra is referring to the stilling the fluctuations of the mind. Abhyasa is the word for practice and vairagya is usually defined as detachment. There are two levels or steps of vairagya, the process of losing the taste for one way and falling in love with a better way. Charles Duhig’s book, The Power of Habit, explains the Habit Loop as a series of cues, routines and rewards. In identifying the habits of the heart that we want to increase and the ones we want to reduce, we need to have to have a keen sense of our cues and the rewards we are seeking. Craving occurs when we begin to anticipate the reward at the moment of the cue. Anger and/or depression is the result of not getting what we want. 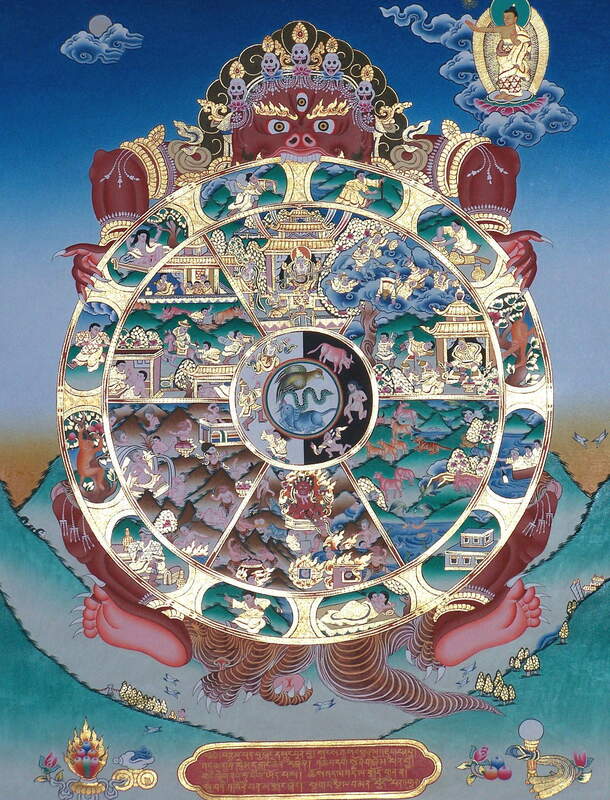 In Buddhist cosmology, this cycle of wanting is at the center point of the Wheel of Cosmic Delusion and feeds off the three poisons (ignorance, attachment or greed, and aversion or anger) and is represented by a pig, snake and rooster respectively. Most agree that anger is a habit to break. The habit of greed is more complex. According to the research, the easiest way to change a habit is to leave the cues and rewards the same, but simply change the routine. Yet, absolutely essential to the new patterns sticking when things get really difficult, is a belief in something bigger than ourselves, a higher power. And nothing helps a person change more than a supportive community that supports and believes in change. Similar to Krishnamurti’s definition of love, the Yoga Sutras define samadhi as “where I am not.” Samadhi, sometimes translated as “absorption”, is the capacity to be intimate with Reality, as things are. Power is the opposite of love. With attention, you might notice that the negative emotions of the heart give a charge and help create a solid sense of self, or I. This very real interior chemical hit, which can feel protective and powerful, is why these patterns of aggression, hate and fear are so hard to break. It feels good to exist, even if it means remaining separate and small. Only once we begin to feel this separateness as painful and have enough experience with and joy of connection, can we begin to break the habit. The practices of Loving-kindness and Compassion that we have been playing with together and the meditations we will continue to play with are designed to allow us to stay fluid, permeable and in the mystery. We are ultimately taking direct aim at the self-cherishing nature of our minds. Vulnerability is key to intimacy and therefore experiencing Reality. So we continue, with great courage. The resources on this page are simply to help create an understanding of habit, so you feel empowered with enough understanding to try.